Do you ever wonder whether you were actually living in the wrong city and that you would probably be more comfortable, happier and better off living somewhere else? I chanced upon this online travel quiz while browsing through fun musical videos and I just had to stop doing what I am doing to take the quiz. If you’ll know me, you’d know that I am such a sucker for these personality quizzes I’d take one at any given time. So off I went to answer the interesting quiz. I got questions like how do I take my coffee, what jam do I go for and what sort of food can I eat forever. I promise you won’t break a sweat when you answer this fun Q+A. So after answering a couple of questions, I got my result and what do you know? 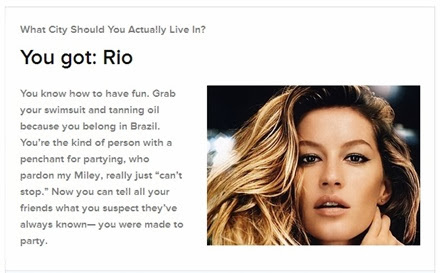 According to my answers, I was supposed to flourish living in Rio! Am just not sure about the penchant for partying as am not really that much of a party-goer, but I am sure I will have a wonderful time if I happen to be living in that beautiful city. I won’t mind visiting its UNESCO World Heritage Site bit every so often and climbing the Christ The Redeemer landmark and taking as many photos of it! I know I will also have a wonderful time at the Rock in Rio Festival, where a lot of musicians will participate. I am sure I will enjoy a beautiful musical performance with musicians playing mpk 49 at guitar center and an assortment of other instruments. And I will most definitely enjoy their lovely beaches! Oh well, I do not think I’d be heading to Rio anytime soon but it is good to know that I will have a grand time living there! Who knows I might just experience that one day, right? This entry was posted in destination and tagged Brazil on January 23, 2014 by Mum Travels. For this week’s Sunday Stamps, I am featuring some of the industry-related stamps I have received. Lucky for me as I have recently got these cool stamps from Brazil that feature the industry of shoe making and dressmaking. I find them really interesting, not to mention colorful and with well-thought of design. Earlier this year, I have also received another stamp that features the colorful industry of fashion. This one is from Spain and feature this lovely and elegant red dress that probably epitomized the beautiful world of Spanish Fashion. These industries may seem little compared to other industries that govern and lord over our societies but come to think of it, shoes and clothing are actually bare necessities and no one can go about in their day-to-day activities without them, so I guess am changing my mind about tagging them as little industries! This entry was posted in stamps and tagged Brazil, Spain on October 6, 2013 by Mum Travels. This is the firs flag card in my postcards collection. This is an official Postcrossing.com card from Brazil with ID#: BR-214573. I never thought I’d like flag cards, but now that I have one, I wonder why I did not went out to collect them in the first place. They will sure make for perfect learning material for the little man. This Brazilian flag card is quite interesting enough to add to anyone’s collection, and don’t you just love the green/yellow combination 😉 I do not know much about Brazil, save that it is the 5th largest country in the world and that it is well-known for its Brazilian football. This entry was posted in official postcrossing.com cards, postcards and tagged Brazil, flag cards on December 28, 2012 by Mum Travels.